...and attach it to your creations! How about a topper with a difference? Try this Ribbon Flower...just for a change! so how about having a go at some flowers made using up bits of ribbon in your stash. 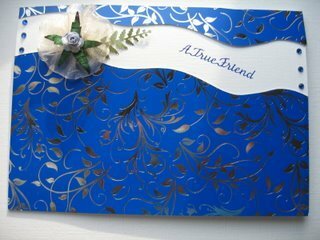 These are very easy to make and can be added to all your cards to suit the color scheme that you are using. I love adding flowers to my cards, for me it adds the finishing touch, and what woman doesn't like to get flowers? You will need a piece of ribbon about 20cms long. 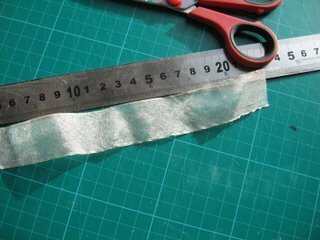 Use silk, taffeta, patterned, plain or any you have in your stash. 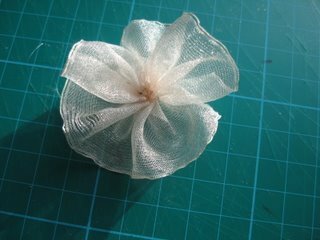 The one I have used here is a cream organza. 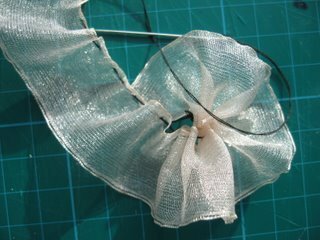 With some cotton to match your ribbon, gather up one of the long edges with short running stitches. 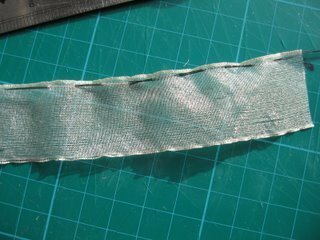 Once you have the stitches through the edge you can then gather up the ribbon until it bunches together. Put a couple of holding stitches in the center of the flower to keep everything in place. And maybe a couple of stitches to hold the two short ends together. This is what your finished ribbon flower should look like...Yes? You can make them in any color you want to. The width of the ribbon you choose will determine the size of the flower. 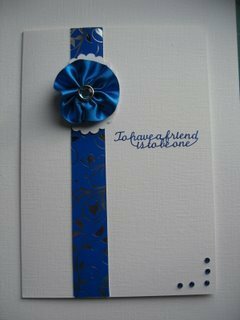 Finish the centers off with a paper flower, Buttons, Brads or Gemstones. 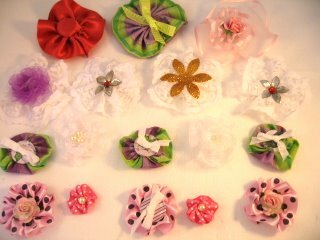 Some of the fabrics used here are silk, cotton, lace and some narrow ribbon. 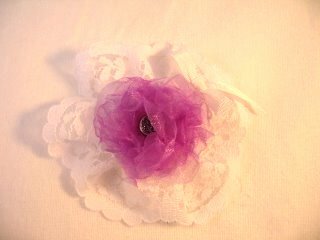 In the centre of this one I have added the Organza flower. Use a strong glue to attach them to your cards. This blue ribbon is silk and quite heavy, so I used my ever trusty Pinflair Glue Gel. A blue gemstone fits in the center. Very plain and very elegant, just a few more gemstones on the bottom corner of the card.